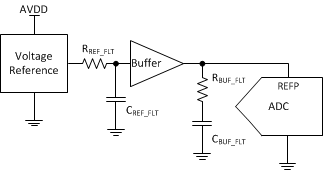 The ADS1259-Q1 is a precision, low-drift, 24-bit, analog-to-digital converter (ADC). The device can perform conversions at data rates up to 14.4 kSPS with high resolution and is therefore ideally suited to measure rapidly changing signals that have a wide dynamic range. An integrated low-noise, low-drift 2.5-V reference eliminates the need for an external voltage reference, thus reducing system cost and component count. The converter uses a fourth-order, inherently stable, delta-sigma (ΔΣ) modulator that provides outstanding noise performance and linearity. The device can use the integrated oscillator, an external crystal, or an external clock as the ADC clock source. A fast-responding input overrange detector flags the conversion data if an input overrange event occurs. To augment data integrity in noisy automotive environments the ADS1259-Q1 offers an optional checksum byte and a redundant conversion data-read capability. The ADS1259-Q1 consumes 13 mW during operation and less than 25 µW when powered down. TI offers the ADS1259-Q1 device in a TSSOP-20 package with full specification from –40°C to 125°C.